What is a Fearless Lionheart? REPENTANCE – WHAT DOES IT REALLY MEAN? I woke up in the middle of the night thinking about repentance. That word repentance means “Sorrow for any thing done or said; the pain or grief which a person experiences in consequence of the injury or inconvenience produced by his own conduct”. When I looked up repentance in the 1828 dictionary, it also talked about “legal repentance” which means the pain, regret or affliction which a person feels on account of his past conduct, because it exposes him to punishment. This “fear of punishment” does not always result in a change of life. However, when true penitence comes (sorrow or deep contrition for sin, as an offense and dishonor to God), true change comes and you turn and run away from that sin and run towards God. Often times, we are simply sorry we got caught which is not true repentance. When true repentance comes, we will see fruit of that repentance because the person’s mindset will change. Their actions will change. They will no longer continue along that path. One who has truly repented will admit their guilt rather than justifying their actions. Justification blames others for their actions. Justification downplays the significance of what they did. This is the way the enemy works. It goes all the way back to Adam and Eve. God gave Eve simple instruction- don’t eat from that tree. The enemy comes along and begins to whisper in her ear. God really didn’t mean that- it’s not that bad. Go ahead- just one bite. The enemy lured her. She justified her actions that one bite really won’t be all that bad. She bought the lie and the consequences were far reaching- throughout all of history even to affect us today. Sound familiar? The enemy’s lies are the same today. Go ahead- it’s really not all that bad. No one will know. God knows and God will always expose sin. There are consequences to sin. For the wages of sin is death- not necessarily a literal death but nonetheless, something will die. Trust dies. Relationships die. Vision dies. Dreams die. The list is endless. The ultimate consequence is separation from God. 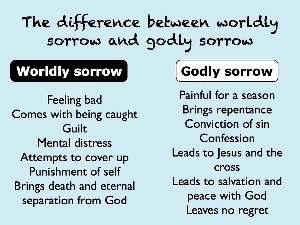 Sin separates us from God- both here on earth and eternally. Our sin doesn’t just affect us- it is far reaching beyond what we can imagine. Sin causes a ripple effect. Many are affected – even down through the generations just as we see with Adam and Eve. The danger of justification is that as we speak those lies justifying what we have done, those lies become our own truth. Because of justification in our mind, that sin really isn’t sin at all although it is direct disobedience to the Word of God. This is a very dangerous place to be in because “truth” only comes from the Word of God. We must continually judge our words and actions by the Word of God. If our actions are contrary to the Word of God, it is sin. So the question today is – are my actions, my behavior and my words lining up with the Word of God? Are there things in my life that I have justified in my mind that are really sin? Prayer for Today: Search my heart of God, reveal your truth to me so that I might be convicted and repent of my sin and turn and run toward you God. Shine Your light in the deepest part of my heart and soul, expose the dark places so that I may walk in Your ways God. In Jesus name I pray. Amen. Holidays are times when families get together and celebrate and enjoy the traditions that have been formed over the years. It’s a wonderful time to reflect on the blessings God has given your family and to reflect on memories of the past. The holidays can also be overwhelming for the person who has had struggles in the past – perhaps they were abused as a child or their childhood was just not good. Perhaps their family environment was that of chaos or turmoil and that turmoil escalated during the holidays. Perhaps the holidays are overwhelming because you are divorced or because you have lost someone you dearly loved. What is your story? I was recently asked to share a holiday tradition. My emotions immediately went all over the scale. The question in my mind was whether I should share a tradition from before divorce, after divorce, before losing a child, or after losing a child. Neither one of those life changing events happened in my life this year or last year but nonetheless, they happened in the last five years and tradition in my life at this season is very different from years past. My emotions and thoughts caught me off guard. My response to the question was that I was simply redefining traditions in our lives. It was wonderful hearing about the traditions of others but I knew I had to immediately guard myself against comparing my life to the life of others. My life doesn’t look like the lives of others and my story isn’t the same as theirs. Your life doesn’t look like someone else’s life. We must remember that we are all unique and our situations are all unique. The amazing thing about our God is that he knows the most intimate detail of each of our lives and He knows just what season we are in and He is always the same-yesterday, today and forever. The night that I was asked the question about tradition, I laid in bed through the night thinking about traditions. I even texted my kids in the middle of the night and asked them what traditions they remembered. Of course, they thought mom a bit silly asking them such a question…. Especially in the middle of the night! Moms can be a bit odd at times! 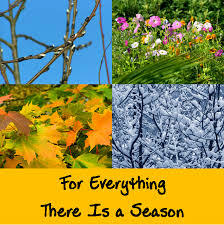 God began to show me that traditions are every changing as the seasons change in our lives. The only thing that stays the same is the Word of God and it is an everlasting Word. There are things in our lives that we have no control over. However, how definitely have control over how we respond to those things in our lives. My thoughts go back to the first of the years of first after my son passed away. He passed away in October so Thanksgiving was the “first” holiday. I dreaded that holiday so much. God did something very special for me that Thanksgiving. I don’t know why but it was very hard at that season in my life for me to go grocery shopping. Even more than regular shopping, the very thought of shopping for Thanksgiving that year just made me sick. One day I got a call from a friend of mine that I used to go to church with. She said that God had put it on her heart to do my grocery shopping for me for that Thanksgiving. She asked me what I typically prepared for our meal. God was the only person that knew how I dreaded shopping for that holiday so He made a way for me in my wilderness moment. All I could do was blubber and cry! I told her how much I had dreaded going shopping and how overwhelmed I was that God cared about that thing in my life that no one else knew about. I gave her my shopping list and she and her daughter went to the store for me and did all my shopping. Not only did she shop for me but it was paid for and delivered to my home without charge to me. To this day, I think about that moment every Thanksgiving season. That Thanksgiving wasn’t like other Thanksgiving because my son wasn’t there with us, but I am so thankful for the memories of the past Thanksgiving we had together and I am reminded every Thanksgiving of the amazing love my Heavenly Father had for me because He knew my thoughts and loved me enough to make my difficult moment easier. My next “first” came at Christmas. Of course, memories flooded me again. I didn’t want to put up the Christmas tree. I didn’t want to shop. I just wanted Christmas over. I did put up the Christmas tree because it was a tradition in our home and although the traditions of the past wouldn’t be the same, I knew God was faithful and He would give us new traditions. Out of nowhere, God gave me special moments that Christmas season. A friend of mine gave me a gift. It an odd gift to most but to me, it meant so much. The gift she gave me was a Christmas ornament of a fish. As I said, it wasn’t your normal gift. You see, my son, Justin, that passed away, loved to fish and we had fishing emblems at his funeral. Time stood still at that moment as memories flooded me – in a good way- as she gave me that Christmas gift. The next year came around and the next year came, and that friend gave me a Christmas ornament or decoration that had to do with fish. Those moments will be forever cherished by me. I smile every time I get these out to decorate at Christmas because God put it in her heart to be a blessing to me. I had many “firsts” over the next year to go through. The first Mother’s Day, birthdays, and all the other holidays. The “firsts” are always the hardest. God taught me to take my “firsts” one at a time. 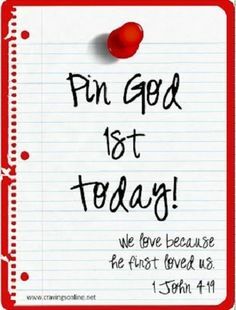 Once that “first” was behind me, He prepared me for the next “first.” You see, they were my first but not a first to God because He had already seen each one of my “firsts”. So guess what? I did come through each “first” and my memories were blessed. Yes, they were hard and I still have my moments. Like the night this week that I was asked about traditions. Maybe you haven’t lost someone by death, but you are divorced. Divorce is tragic. Divorce is difficult even if you have remarried. The original family unit is severed in divorce. Things are never the same. Family traditions are broken and the holidays are difficult for divorcees. Memories of the past can be overwhelming for everyone – the parents and the children. Just the very logistics of getting everyone together can be overwhelming. If you are remarried, there is the awkwardness of blending. Sometimes we wonder how God can ever bring beauty from the ashes of our lives. We can’t be concerned with the “how” but we must rest in the promise to do a new thing. God showed me something about our memories from Proverbs 10:7 after the passing (or “graduation” as his 5 year old little girl says) of my son. It is found in Proverbs 10:7 “The memory of the just [is] blessed….” Our memories can bring us freedom or hold us captive. This scripture in Proverbs has ministered mightily to me. You see, God’s Word brings life. When most people read that scripture, they relate it to the memory of those that have passed away…. And how the memory of the righteous are blessed after their death or the just opposite (if you read the rest of that scripture). I remember reading this scripture and The Lord spoke a word to me that changed the entire meaning of that scripture for me. It was revelation and became personal and gave me peace. It was a NOW Word I so desperately needed. So many times, when those things happen in our lives (emotional hurts, death, broken relationships, etc.) we relive those moments over and over and over and over in our minds…. Every single detail. Our mind is like a VCR and the enemy puts the VCR on repeat and it doesn’t shut off. The smallest thing triggers the memory – even being asked about something as innocent as traditions. We can be tormented by those memories. The Lord revealed to me that IF I will surrender those hurts to Him and allow Him (which is an ongoing process), He will heal those hurts and wounds and will bless my memory. However, the choice is mine as the enemy tries to torture our mind with the hurt and pain until it steals our future. I must run to HIM and not away from The Healer. In other words, as I meditate on God’s Word and take every thought captive that does not line up with the Word of God and saturate myself daily in His Presence, I will come to the place that my memories will no longer torment me. He will bring me to the place that I don’t remember the torment of the pain, but I will remember so I can minister to someone else. The memory will be that of the hope and peace that God gave me though my circumstances. Yes, it is a process and it takes time but God is so very faithful to His promise. I am so thankful for the revelation of the Holy Spirit that made His Word so real to me. I don’t know what your story is but God knows your story and He knows just where you are in this season of your life. Trust Him with this season of your life. God is faithful. He is ALWAYS faithful and ALWAYS causes you to triumph. He will never ever ever leave you in your circumstances. You are not alone in this holiday season. Maybe your traditions will never look the same, but God wants to redefine tradition and give you new traditions and new memories. I am so thankful for the memories and traditions of my past. I cherish those memories. I also look forward to the new memories and new traditions God has for my life because God has great things in store for me and my family, just as He does you and your family. I am praying for your holiday season to be blessed, that your memory will be blessed and that you will know the peace of God in whatever “season” you are in during the holidays. 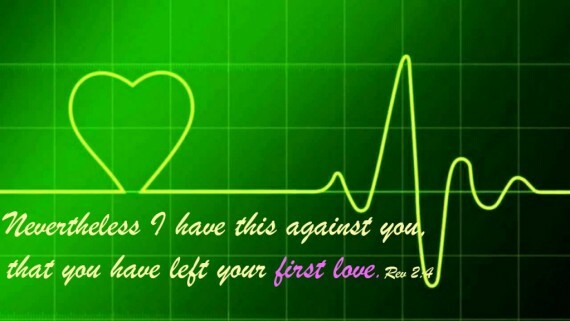 I began to think about “first love.” Remember when you first fell in love with your spouse? You thought about him or her every moment. You couldn’t wait to see that person and you ran to the phone every time the phone rang hoping it was them. Your heart began to race whenever you saw them. You found yourself daydreaming about the last time you were together or about the next time you would be together. Suddenly, you became very creative with the hours in your day making time for the one you love. You made excuses to get to see them for just a moment. You were always planning something special to make memories. Hopefully, none of that stopped whenever you got married but to many people, that newness and excitement wears off and they settle into married life and become complacent in their marriage and they forget the need to continue to date and keep their relationship fresh and anew. If one is not careful, marriage becomes routine and you just go through the motions out of the commitment of marriage and you end up with two very separate lives under one roof. You forget what it was like when you first fell in love. Sometimes our relationship with the Lord can be the same way. We just go through the motions because of our commitment as “Christians” and lose that zeal and fervency for the Lord. We should never become complacent in our marriage and we should never become complacent in a relationship with the Lord. What are some signs that you have lost your first love? 2) Have you lost the desire to worship and spend time with the Lord and fellowship and pray and spend time in the Word? This is how our relationship with our spouse deepens- by spending time with them. When you spend time with someone, you begin to know their thoughts and their desires. It’s the same way with the Lord. When we spend time with the Lord through worship and prayer and studying the Word, relationship with Him deepens. The enemy despises the time that you spend with the Lord and goes to extremes to make sure that is interrupted and and time with the Lord becomes less and less priority in our lives. 3) Do you find that your thoughts towards the Lord are not what they used to be or as often or your thoughts do not honor the Lord? Philippians 4:8 says “Whatsoever things are true, whatsoever things are honest, whatsoever things are just, whatsoever things are pure, whatsoever things are lovely, whatsoever things are of good report; if there be any virtue, and if there be any praise, think on these things.” The word of God says that we are to pray without ceasing. (1 Thess. 5:16-18) That really means to always be an attitude of prayer– that He is always on our mind thru our day and that we are to continually meditate on the things of God. We are to let praise continually be in our mouth. (Ps. 34:1) In the busyness of life, we must guard our thoughts so that we keep Christ in the center of those thoughts. 4) Do you find yourself making excuses (for your actions or your disobedience)? As we grow up and mature in the Lord, God requires more of us, not less. Our obedience to God demonstrates our love for Him. Jesus said, “If ye love me, keep my commandments” (John 14:15). “If ye keep my commandments, ye shall abide in my love” (John 15:10). If you find yourself making excuses for your actions or lack of action or your disobedience to the things of God, that’s a sure sign you need to return to your first love. 5) Do you find that your “get to” has become a “have to”? God wants us to be cheerful givers and not just with her money but with our time and our love and our compassion, etc. Colossians 3:23 says that “Whatever may be your task, work at it heartily (from the soul), as (something done) for the Lord and not for men.” The enemy wants to steal that attitude of we get to do this for the Lord or as unto the Lord until it becomes I have to go to church or I have to do this, etc. We must return to the whys we serve-to please God and not man. These are just a few ways recognize the symptoms of losing your first love. If you have the symptoms, the good news is they God is waiting for you to return to your first love. Simply repent and ask him to return to you the joy of your salvation. Prayer for today: Father God, I repent for becoming complacent in my love for you. I repent for not putting you first in my life. Forgive me for putting other things before you. God, I ask you to show me how to re-prioritize things in my life. Show me the things I need to let go of and release in order to have that intimate time with you and to draw closer to you. Father God, show me the things that have become a hindrance in my life and those things that are not pleasing to you. Father God, I ask you to restore to me the joy of my salvation and help me in my obedience to you. Create in me a clean heart. In Jesus name I pray. Amen! Although you don’t see the word “soul ties” in the Bible, there is plenty to be said about soul ties. The Bible talks about becoming one flesh. Soul ties tie two souls together in the spirit realm. 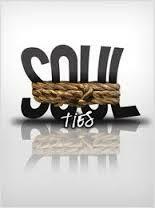 One type of soul ties is sexual soul ties. Soul ties are formed when a couple are married (Ephesians 5:31, “For this cause shall a man leave his father and mother, and shall be joined unto his wife, and they two shall be one flesh.”). This would mean then that when two people come together who are not married, ungodly soul ties are formed. This ungodly soul tie fragments the soul and is destructive. This is why people (and not just teenagers) who are sexually active have such a difficult time breaking away from their boyfriend or girlfriend. They have ungodly soul ties with the other person in the spirit realm. This is why you may see one that is controlled, manipulated or abused that stays with their boyfriend or girlfriend … there is an ungodly soul tie with that person that hasn’t been broken. Any sexual relationship outside of marriage creates those ungodly soul ties and must be broken. There are also married people who need to break ungodly soul ties from past relationships. Fornication is a very common way to create a soul tie. If a person has more than one sexual partner, then they have ungodly soul ties with multiple people. In essence, you now have ungodly ties with those that they have ties with although you didn’t literally have relations with all those other people. Their soul is further fragmented and divided with multiple people. This picture is a great illustration of what happens in the spirit realm. This word is not to condemn but to bring freedom to those who might find themselves in this situation. Breaking ungodly soul ties are vital to your spiritual freedom. I know this is plain talk but its vital! 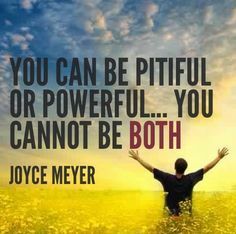 ARE YOU PITIFUL OR POWERFUL? In my own life, I have had to make the choice to be pitiful or powerful. Death of a son, divorce, troubled relationships, etc. I had a choice to make. I could have chosen to dive into the pit of woe is me, why God, become unforgiving, angry and bitter, wallow in self-pity and fall into that self-destructive pit or I could choose to run to Jesus and allow my trials to become my testimony. What’s your story? I’m sure self-pity has come knocking at your door at some point in your life. Maybe it’s a job situation, finances, inability to have children, severed relationships, loneliness, etc. You fill in the blank. These are all situations the enemy wants to use to introduce you to self-pity. Self-pity is a spirit. It is really idolatry because it is putting SELF before God. Self-pity causes us to be consumed with me. Self-pity is excessive love of oneself which is the opposite of what God says we are to be which is selfless. Ouch! My pain, my hurt, my disappointments, my truth, my perception, how I have been mistreated, how nobody knows what I have been through or how I have been wronged. Self-pity can leave us stuck in the “why me Lord” mindset. Every spirit has an agenda and self-pity is no different. As with all spirits, they are openings to other spirits. Self-pity portrays a victim mentality. Self-pity doesn’t stop with self-pity but escalates to manipulation. People manipulate because they aren’t getting their needs met so they do and say things to place guilt on others to get their way. They play the victim and act helpless, blame others for all their problems and take no responsibility for their own actions. Self-pity usually leads to unforgiveness, anger, hatred, resentment, rebellion, even a murderous spirit (with our words and sometimes our actions) and bitter broken heart. It also opens the door to depression and self-pity will make you sick. Self-pity will keep you from finishing your race and it will steal your joy. Self-pity is a thief. It will distort your view of others which will cause jealousy. Jealously can be deadly because it causes your tongue (the smallest but a deadly weapon) to speak lies against others. 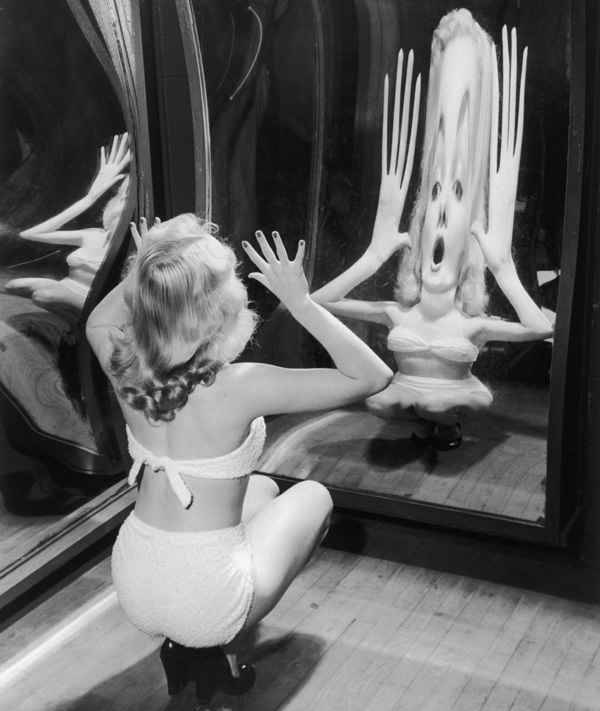 Have you ever looked in one of those mirrors that change your body shape? That’s what self-pity does. It distorts our view of not only ourselves but others and that distortion causes us to speak badly of ourselves and those who have what we don’t seem to have. If we don’t guard against self-pity, the ME MONSTER will take over our thoughts and our lives becomes all about self. The enemy doesn’t stop at self-pity. It is just one door to the Kingdom of Self. Self-pity, self-hatred, self-rejection, self-righteousness, self-indulgence. Self. Self. Self. Do you get the picture? Self-pity is a self-centered mindset and takes the focus off Jesus and what He did on the cross for us. Self-pity requires no faith because it’s all about me. Many who are consumed with self-pity don’t really want to be healed or victorious because it will no longer be about them. Self-pity would rather receive sympathy for their circumstances than to be set free and be victorious. I know that’s a harsh truth but it is truth nevertheless. Have you ever noticed that their conversations are all about them and their problems and their hurts and their woes and rarely addresses their own role in their circumstances or what they can do to change their circumstances or who they can run to (Jesus) in prayer and how He changes EVERYTHING? Self-pity becomes like a security blanket to them. Self-pity always shifts the blame to someone else and they never take responsibility for their own actions. Another example is the widow woman found in 2 Kings 4. She could have chosen to feel sorry for herself because her husband had died and she and her sons were left in a dire situation. Instead, she chose to trust the man of God, Elisha, and did as he said and as a result, she was able to pay her debt and live her life victoriously. Then there’s the woman in 1 Kings 17 who was making the last meal for her and her son and then planned to die because she had no food and no way to provide. She could have stayed in that pit BUT she chose the path of provision that God made for her. She listened to the man of God. She could have chosen to just eat that last meal and die but she chose to be powerful rather than pitiful. Jesus Himself could have gotten stuck in the self-pity trap. Why Father? Why do I have to die for THEIR sins, for THEIR sickness? He chose to do the selfless act of love. He chose to say “Father, if you are willing, take this cup from me; yet not my will, but yours be done.” Luke 22:42. I’m so thankful that Jesus didn’t get trapped in self-pity. It was all about us as He surrendered His life. Jesus was selfless. Who are we to pattern ourselves after-the one who gave His all for us? Now let’s take a quick look at one man who got all caught up in self-pity- King Saul. He was a King with great destiny. But guess what? He became jealous of David and self-pity grabbed hold of him. Self-pity cost King Saul his anointing and his destiny. I realize we are all human and aren’t always going to do it right. However, we must be aware of the enemy’s covert plans to set these traps for us to destroy us along our journey. The enemy wants to keep us bound up in shame, guilt, and bitterness. He will use self-pity as a video player to replay all of our mistakes of the past and fear (of the unknown, of failure, of loneliness, etc.) to paint a picture for your future. 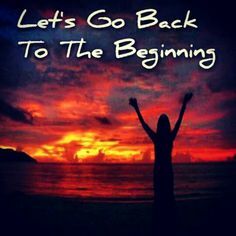 When we truly repent of our past mistakes (and not just sorry we got caught), we must leave the past in the past and refuse to replay it over and over in our minds. We cannot fulfill the Great Commandment to love God with all our heart when these things rule our lives. Self-pity needs to be denied, because it keeps us from being fulfilled in Jesus. Do you find yourself wallowing in self-pity? To break free from self-pity you must surrender “self” to Jesus and change the focus from you to Him and begin to praise the Lord with a grateful heart. If you want to be set free from self-pity, you must recognize that it is an issue and surrender it to God. 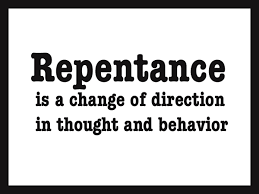 You must repent (change your thinking and turn and run the other way). You must put your focus on God. Learn to praise him in all circumstances (whether you feel like it or not) and have a heart of gratitude. You must forgive. Unforgiveness will keep us trapped in self-pity. You must lay it down and repent of unforgiveness – let it go and forgive. Grab ahold of God’s promises and what God’s truth is. Stop depending on others to fill your needs and rely on God. You must deny the Kingdom of Self and focus on the Kingdom of God. I encourage you to be determined not to waste one more day of your life in self-pity. When you lose hope and begin to feel sorry for yourself, STOP! Begin to say SELF, you will not rise above the word of God. I CHOOSE to believe what God says about me and my situation and my God ALWAYS causes me to triumph. Devil, you are a liar and you have nothing to say to me. Choose to be powerful and not pitiful! You cannot have victory without surrender. True victory will always require us to lay something down which is usually our own will. Surrender is never easy and it involves laying down our wants, our desires, our opinions, our temptations and even our preferences. God wants all of me –not just part of me. I don’t know about you but he’s asking me to lay down some things so that I can have true victory in my life which will help others have victory in their life. Is God asking you to lay something down so that you can have complete victory in an area of your life? Then Jesus said to His disciples, ‘If anyone desires to come after Me, let him deny himself, and take up his cross, and follow Me. For whoever desires to save his life will lose it, but whoever loses his life for My sake will find it'” (Matt. 16:24-25, NKJV). Ever Feel Like a Failure? So if you failed and really messed things up, dust yourself off and get back up because today is a new day and He will make all things new. I am so thankful that I serve such an amazing God!